Chen Pi is such a wonderful herb. Recently I have been craving it so much! Possibly because you just can’t find citrus at the farmers market here. I miss California and its citrus availablity so much since moving to the South. Sometimes the selection at the market will just have to do. 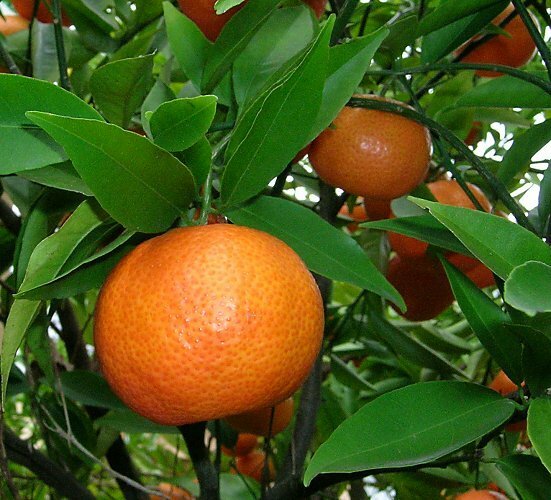 Anyways, the herb today is the tangerine peel. It is considered a middle jiao (MJ) herb and regulates the qi. The organs associated with the MJ are the Stomach and the Spleen. In Chinese Medicine, the theory of Chen Pi is by regulating the qi in the MJ, the digestions function will be balanced. Bloating and fullness will decrease as well as feelings of nausea and vomiting. Another side of this theory of regulating the MJ, is that the speed of digestion will be less sluggish, making it become more efficient. If the digestion becomes sluggish, a residual excess will occur. Think about a hose being clogged and the water will slowly come out, this is your digestion. That matter that is clogging, we interpret as Dampness. While the Spleen creates the dampness the Lung is its container. Therefore this herb is great for drying phlegmy coughs. In summary, Chen Pi is for regulating your digestion, drying the damp and transforming the phlegm. Other than simmering Chen Pi in some hot water for a tea, a great and delicious way to include it into your diet is to eat it covered in chocolate! I love the ones you can order from Fran’s Chocolates, even though they are technically orange peels. They are beyond delicious! You can also easily make them at home. Slice the ends (the tops and bottoms) off the oranges, score them from one end to the other, and then peel the oranges so that the peels come off in one piece. 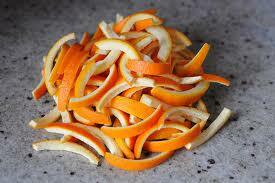 Slice the peels into thin strips and trim the edges if needed. 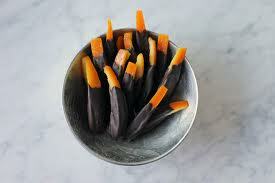 In a medium pot, bring water to a boil and then blanch the orange peels in the boiling water for a few minutes. Drain and rinse the peels and then repeat the process again—blanching the peels twice removes the bitterness. In a saucepan, combine the 8 ounces of water with 8 ounces of sugar and bring to a simmer. Add the peels to the simple syrup, cover the pot, and simmer for 1 hour. I would check it every so often and give it a stir to make sure all the peels are submerged. Once cooked, transfer the peels to a rack to cool and drain (I placed wax paper underneath my rack for easy cleanup). In a double boiler over simmering water, melt the dark chocolate. Dip each of the candied orange peels into the dark chocolate and then place them on parchment paper. Once the chocolate has hardened, store in an airtight container. Makes a big batch or 6 servings according to the original recipe. 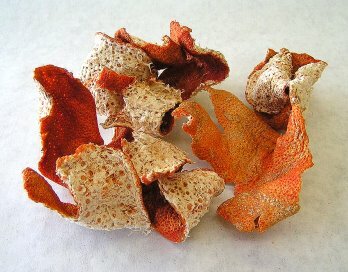 Orange Peel is great for face masks too! Have fun! Stir until well-mixed and combined. You’re looking for a consistency that is thick, but not too runny so it will stay on your face. You can always add extra oatmeal to thicken. Spread onto your freshly washed and dried face in an even layer, being careful to avoid the eye area. Leave on for 15-30 minutes. I also found a blog post that give you step by step instructions on making your own Chen Pi! Thanks Robin!